My name is Jennifer Avila, my brother was jeffrey avila. I just turned 28, my first birthday without my brother, he died a few months ago at 31. I decided to make a site to show people the sad truth about cancer. About doctors, nurses and hospice. I wrote a diary on my blog called Jeff's story, its 19 months of ups and downs and finally... down since he never recovered. I think if treated on time some people might have hope. My brother had a stage 4 brain tumor called astrocytoma. it grows everywhere like tree branches, very hard to remove and very aggressive so not even chemo killed it. But there are so many natural remedies i read about helping boost the inmmune system that if someone on the first stages of cancer follows, he/she will make it. Im not trying to sell anything, i work doing computer software quality assurance so dont think im trying to sell medicines or services. im just here to share what i learned, things like opening your eyes at hospitals to watch nurses stupidity which is greater than you can imagine. Don't always obey the doctors when they say don't feed a patient.. food is always important. If they say "hes got 3 months left" cut that in half as they exagerate. If you want to know about us. We were born here... raised in Ecuador since our parents are from there, and came back to find a future here in 97. My brother joined the army, studied art, then worked in a tattoo shop in venice beach, he loved singing and drawing and he died in the most powerful country in the world. I miss him like ive never missed anyone before. If you read the whole blog (19 month diary pretty much) hopefully it helps with do's and dont's. good luck. 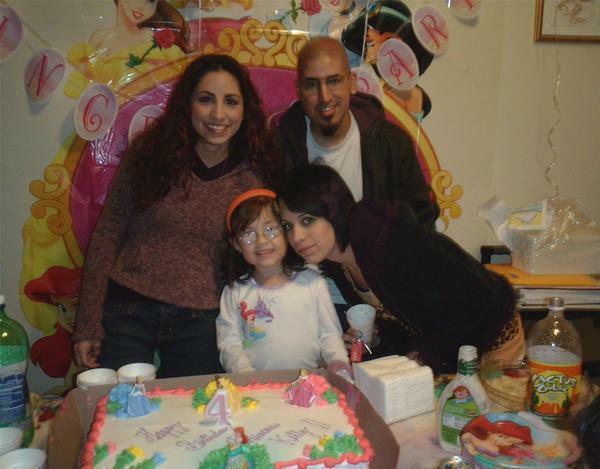 in the picture: Me, my bro, his daughter kelly, and my sister Janneth.